Rembrandt, “Portrait of a Man with Arms Akimbo,” 1658. The gallery notes that “the provenance of the painting is notable.” “Notable” is an understatement. “Portrait of a Man with Arms Akimbo” has a sale history worthy of a novel. Otto Naumann Ltd. traces the sale history of the painting back to 1798, but the provenance becomes juicy in 1939 when Huntington Hartford II, the A & P supermarket heir, purchased the painting. In 1955, he donated the painting to Columbia University. hanging above the university president’s desk. Upon his death in 1983, Johnson’s third wife, Barbara Piasecka Johnson, inherited the painting. The painting never appeared publicly while the Johnson’s owned the work. 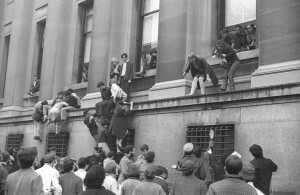 The painting remained out of sight for 41 years: from 1968, when the Vietnam War protesters saved the priceless cultural icon until 2009, when Ms. Johnson sold the painting at Christie’s London. The 2009 Christie’s sale was teeth clenching. According to Carol Vogel’s New York Times report, Otto Naumann and Alfred Bader, a Milwaukee art collector, worked out a plan to purchase the painting jointly. Vogel claims that the pair prepared to spend $40.3 million with a deal from Christie’s for extended terms of repayment. But, on the day of the sale Christie’s withdrew the extended payment plan, possibly with some inside information. This left Naumann and Bader high and dry. When the hammer fell, the final bid was $33.2 million including Christie’s fees. The winner: Steven Wynn, Las Vegas casino mogul and flamboyant collector. The price set a new record for Rembrandt. The painting is now back on the market. It was unsuccessfully offered for sale at the European Art Fair in Maastricht for $47 million. And now, the painting is publicly for sale at Otto Naumann Ltd. The change of hands has created a firestorm. Particularly between Jon Weiner of The Nation and Judith H. Dobrznski of Real Clear Arts. 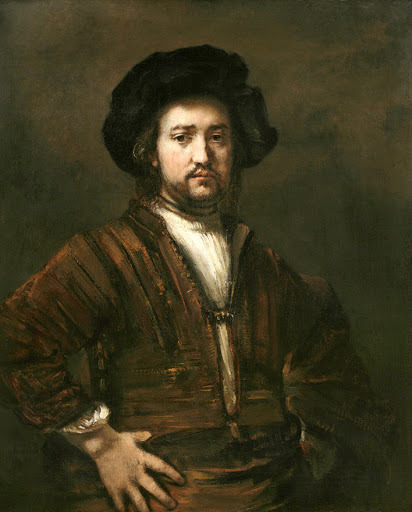 Mr. Weiner labels Columbia as “barbarians” and “foolish” for selling the Rembrandt for pittance in 1975 when it is now offered for sale in the $47 million range. He stated: “All Columbia undergrads were, and still are, required to take Art Humanities, a survey of masterpieces of Western art, including Rembrandt. The purpose is to instill a respect for this great tradition. Apparently that respect was not shared by the Columbia administration.” Mr. Weiner uses the Columbia transaction as an example to prove that the sale of artwork by university’s is always a bad idea, referencing the scandal that surrounded the Rose Museum at Brandeis University. Whether you believe that it was morally wrong for Columbia University to sell the painting, or that they were cheated with the $1 million sale, this story reminds us that art is a commodity to be bought, sold, and traded. Art is an “income producing asset,” as Columbia stated in 1975, no matter the circumstances. Sources: Otto Naumann Ltd.; Carol Vogel, “Casino Chief Said to Own Rembrandt,” The New York Times, December 19, 2009; Jon Weiner, “When Universities Sell Art: The Case of Columbia’s Rembrandt,” The Nation, January 21, 2013; Judith H. Dobrzynski, “Columbia University’s Big Mistake? Or Misconceptions about Deaccessioning?” Real Clear Arts, January 22, 2013.